Pineapple is a delicious, nutrient-dense tropical fruit with a lot of health benefits. But when it comes to over-the-counter cough suppressant syrups, is pineapple juice for cough relief a better natural remedy? Pineapple juice for sore throats and coughs may be the remedy for you. 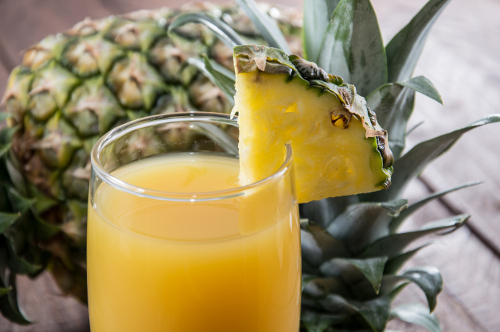 Research suggests that pineapple juice is indeed five times more effective than cough syrup. An enzyme called bromelain in pineapple is a key reason for that. As a result, Amish populations have been using pineapple juice for generations as an alternative to those synthetic cough remedies that many people use today. This article will detail exactly how pineapple juice is effective against coughs. We will also provide many pineapple recipes for cough, including how to make cough syrup with a number of natural cough remedies. Is pineapple juice good for a cough? Pineapple juice may treat a persistent cough when the cause isn’t a more serious condition like pneumonia. For a mild cough, it might be a good idea to try the fruit drink. There are key nutrients in pineapple juice that may help soothe the symptoms of a cold and cough. You may have heard about bromelain for cough in particular. Bromelain is a key enzyme in pineapple that has strong anti-inflammatory properties that could potentially help treat respiratory problems, including asthma and allergies. The mucolytic (mucus-thinning) properties in bromelain also help break up and expel mucus in the sinuses or lungs. On top of that, the vitamin C in pineapple is commonly used to reduce coughs, colds, and flu symptoms. Pineapple juice and bromelain are known to help a wide variety of respiratory allergic conditions, including allergic airways diseases, allergic asthma, bronchial asthma, and chronic obstructive pulmonary disease (COPD). All of these conditions can cause terrible wheezing and coughing. Pineapple juice may enhance the breakdown of mucus and expel the slimy substance. A study published in the International Journal of Scientific and Research Publications in 2015 found that pineapple juice could significantly improve patients with bronchial asthma. For the study, the participants consumed 100 ml of pineapple mixed with equal amounts of water twice daily for a 90-day period. Other research has shown that bromelain decreases allergic sensitization in mice with asthma. A review by Indian researchers published in 2010 found that pineapple juice was part of an effective remedy for tuberculosis. In the study, the combination of pineapple juice, pepper, salt, and honey decreased cough symptoms up to five times quicker than over-the-counter cough syrups. The bromelain in pineapple juice could also help for coughs due to sinus problems. You may find relief because bromelain works as a natural antihistamine, decongestant, and anti-inflammatory remedy. It may reduce cough and nasal mucus associated with sinus inflammation like rhinosinusitis. Studies show that a 600 mg daily dose of bromelain for three months could help those suffering from chronic sinusitis. It is possible to get canned pineapple juice for cough and colds; however, making your own pineapple juice recipes for cough and cold is much better than anything from the store. The zest of ginger combines well with pineapple. The immune-boosting herb known as ginger is great for improving respiratory function due to its bioactive ingredient gingerol. Cut the pineapple into one-inch chunks. Place the pineapple and ginger into your juicer. Alternatively, you can combine the pineapple, ginger, and a cup of filtered water into your high-speed blender. The following recipe combines several of the best anti-inflammatory herbs and foods, including lemon juice, pineapple juice, ginger, raw honey, sea salt, and cayenne pepper. It makes an effective cough suppressant that may be better for you than the average cough syrup on the market today. Combine pineapple, lemon, and ginger in a low-speed juicer. Stir in raw honey, salt, and cayenne pepper. Enjoy a quarter cup two to three times daily for the best results. Rather than juicing the ginger, you can mince the ginger and add it to the mixture with the rest of the ingredients. Combine the honey with the pineapple juice. Warming the pineapple juice will help the honey dissolve quicker and more evenly. Alternatively, you can chill the remedy or pour ice over it for a cold beverage. Combine pineapple juice, chopped strawberries, and a cup of pineapple chunks in a high-speed blender. Pour the mixture into popsicle molds, and let it sit in the freezer for at least three hours, or until it is solid. Carrots, pineapple, and oranges also make for a great juice that is perfect if you have a cough. The end result is a bright orange masterpiece. The recipe will take about 10 minutes, with most of the time spent cutting up the fruit and vegetables. Turn on your juicer and add pineapple, carrots, and orange. Also, add spinach if you are using it. Pour juice into a glass and serve. Combat a cough with this super greens-and-pineapple-juice recipe. It is a perfect blend of vegetables, fruit, and ginger. This anti-inflammatory green juice pineapple blend can be just what your body needs to get through a cough or cold. Add all ingredients to a juicer. Gently stir, and consume right away. Pineapple juice for cough and cold is great; however, there are a few key points to remember when using it. First off, always use fresh pineapple juice rather than canned pineapple juice for cough and cold. Canned or pasteurized pineapple juice does not contain enough bromelain to be effective for your cough or cold. Not to mention that canned juices are sweetened and most people don’t need added sugar in the diet. Also, keep in mind that extremely high doses of vitamin C may cause nausea, diarrhea, vomiting, abdominal pain, heartburn, insomnia, and headaches. This is important to consider since pineapple is a very high source of vitamin C.
The bromelain in pineapple may also interact with certain medications, including antidepressants, blood thinners, and insomnia medications. That is why it is a good idea to consult with your doctor before using pineapple juice for cough and cold, especially if you take these medications. Pineapples can be stored at room temperature. But because pineapples stop ripening when picked, they will go bad quite quickly. It is best to use pineapple immediately once you cut it; however, once cut, it can be kept in an airtight container in the refrigerator for two to five days. That being said, the pineapple flavor likely will change. Is Pineapple Juice for Cough Right for You? Pineapple juice for cough and cold is often a good idea. That is due to the bromelain and vitamin C contained within the pineapple. Studies even show that pineapple juice can be helpful for respiratory conditions, such as bronchial asthma, tuberculosis, and chronic sinusitis. When you do come down with a mild cough, cold, or respiratory condition, rather than taking a cough syrup, try some of the recipes for cough mentioned in this article. You may be glad you did. Not only might they relieve your cough, but they taste great, too! How To Get Rid Of Dry Cough Fast? How Does Benadryl Raise Blood Pressure? Sharma, S.P., et al., “A Study on Nutritional Efficacy of Pineapple Juice in the Treatment of Bronchial Asthma,” International Journal of Scientific and Research Publications, January 2015, 5(1), ISSN: 2250-3153. Kumar, N., et al., “Use of Secondary Metabolite in Tuberculosis: A Review,” Der Pharma Chemica, 2010, 2(6): 311-319, ISSN: 0975-413X. “Drink Pineapple Juice for Cough Relief and More!” Cure Joy, Sept. 1, 2017; https://india.curejoy.com/content/pineapple-juice-for-cough/. “Bromelain,” University of Maryland Medical Center; http://www.umm.edu/health/medical/altmed/supplement/bromelain, last accessed Oct. 26, 2017. Widmer, B., “Pineapple Juice is 5 Times More Effective Than Medicine for Cough,” Lifehack; http://www.lifehack.org/451257/pineapple-juice-is-5-times-more-effective-than-medicine-for-cough, last accessed Oct. 26, 2017. “Carrot Pineapple Orange Juice,” Two Peas & Their Pod; https://www.twopeasandtheirpod.com/carrot-pineapple-orange-juice/, last accessed Oct. 26, 2017. “Pineapple Juice for Cough,” Home Remedies for All; http://www.homeremediesforall.com/food-remedies/pineapple-juice-for-cough.html, last accessed Oct. 26, 2017.